Charleston SC – Reeve Conover has been recognized for his hard work and expertise in helping consumers enroll in and manage qualified health coverage through the Health Insurance Marketplace. This nationwide recognition from the Centers for Medicare & Medicaid Services (CMS) as a member of the 2019 Marketplace Circle of Champions highlights Reeve Conover success in enrolling more than 40 consumers during this Open Enrollment Period. “Consumers turn to agents and brokers for trusted advice and guidance in selecting plans, enrolling in coverage, and managing their health insurance policies throughout the year,” said Randy Pate, Director of Center for Consumer Information & Insurance Oversight (CCIIO) operation within CMS, which oversees the Marketplace. 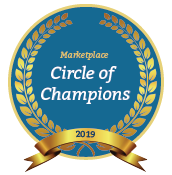 “We thank Reeve Conover for his hard work and exceptional service in helping Americans get coverage.” The Marketplace Circle of Champions program recognizes the hard work, expertise and service of Marketplace-registered agents and brokers. Agents and brokers who assist 20 or more consumers qualify for the Marketplace Circle of Champions. Eligible consumers can enroll in Marketplace coverage during this year’s Open Enrollment Period, which runs November 1 – December 15, 2018. Consumers with questions about their coverage or who would like help enrolling, can contact Reeve Conover at 843-800-8190. This entry was posted	on Sunday, January 20th, 2019 at 7:52 am	and is filed under Uncategorized. You can follow any responses to this entry through the RSS 2.0 feed. Both comments and pings are currently closed.